I'm just back from the supermarket. I've got some cucumbers. And one of them is a bent one!!! YEAH! 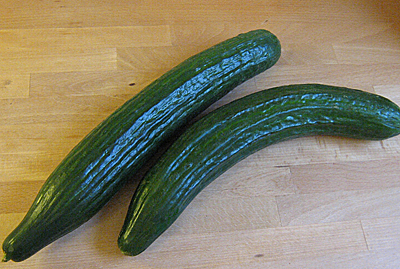 I haven't seen one in 22 years now since in 1988 the European Bureaucracy banned them with its „bent cucumber rule“. Cucumbers had to be entirely straight to make it into the supermarkets. What an incredible rubbish! In 2008 this EU ban was scrapped BUT the bent cucumbers didn't come back. In Germany the discounters wanted to stick to the straight ones – to keep the prices up. Which is just another hogwash because cucumbers always are fairly cheap. I'm completely against standardisation of fruit and vegetables. We've had to live for so long with the bad results of such madness. Not only disappeared a lot of cultivars, the remaining produce became bigger, uniform and optically flawless, all at the expense of taste and nutrient content. That one bent cucumber makes me hope for the return of all the tasteful varieties we had in the past. I'm patient. I had read somewhere that the bent and knobbly produce partly is used for fast food and partly indeed it is dumped! It's unbelievable!